Anthony Adcock blends his unique experience as a Local one Ironworker, a collegiate instructor, and as an artist to create works that focus on the relationship between labor and value. Using hyper representational paintings, illusionistic sculpture, and short films, he distorts the line between reality and perception to question the importance and relevancy of authorship. His work has been published in New American Paintings and has been shown throughout the country in various galleries and venues which include Packer Schopf Gallery in Chicago; Lovetts Gallery in Tulsa, Oklahoma; and at the M Gallery of Fine Art in Charleston, South Carolina. 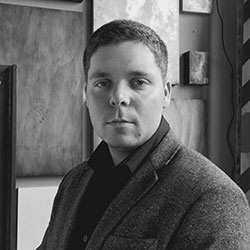 Anthony received his Master of Fine Arts degree from the University of Chicago and his Bachelor of Fine Arts degree from the American Academy of Art with a specialization in oil painting. Anthony is a full-time faculty member at the American Academy of Art and works out of his studio in Chicago.